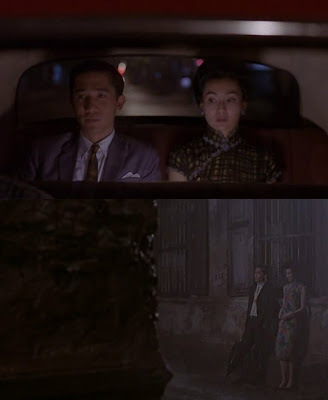 So far I've only watched two films by Wong Kar Wai, which are In The Mood For Love and My Blueberry Nights, and I think he does very well at making spectacular artworks out of the simplest stories. 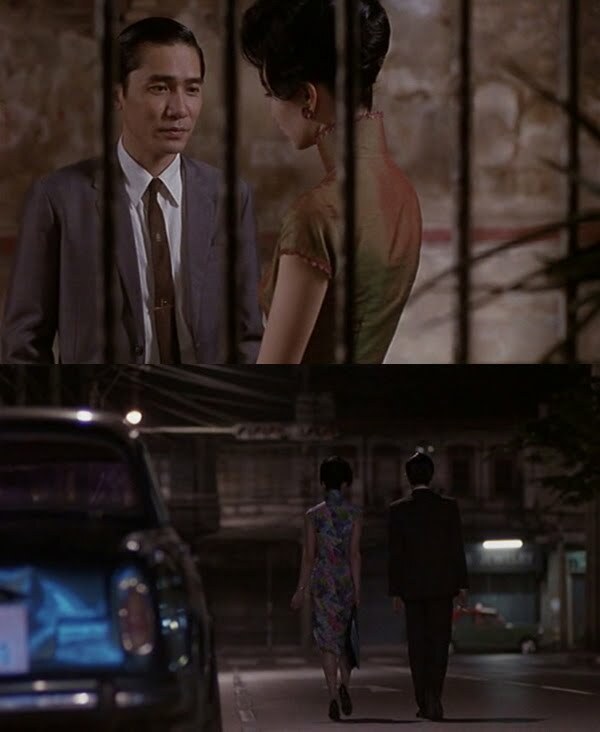 In The Mood for Love shows the development of a love relationship between next-door neighbors. Each has a spouse who's always away at work and who the protagonists think are actually involved with each other. The everyday scenes such as going to the noodle stall and eating alone are drawn out to the point that they almost drag, but only to say, "This is our everyday situation. Surely you can understand how this thing between us came to be." The relationship that forms between them, however, despite everything, is platonic. The female protagonist declares at one point, "We will never be like them!" while she and the male protagonist speculate about their spouses' offscreen love affair. Putting yourself in either of their shoes, you will most likely find it hard to restrain yourself. Which is why you can't help but feel sadness and regret for them. And, at the same time, respect. Notice how a lot of the shots in the movie were taken from behind objects such as hanging clothes, window grills, and bars. You really feel like you're spying on the couple. The film was supposed to have been titled, appropriately, Secrets, but Cannes encouraged that Wong change it. And so he did to a song he had been listening to—Bryan Ferry's cover of "I'm in the Mood for Love." 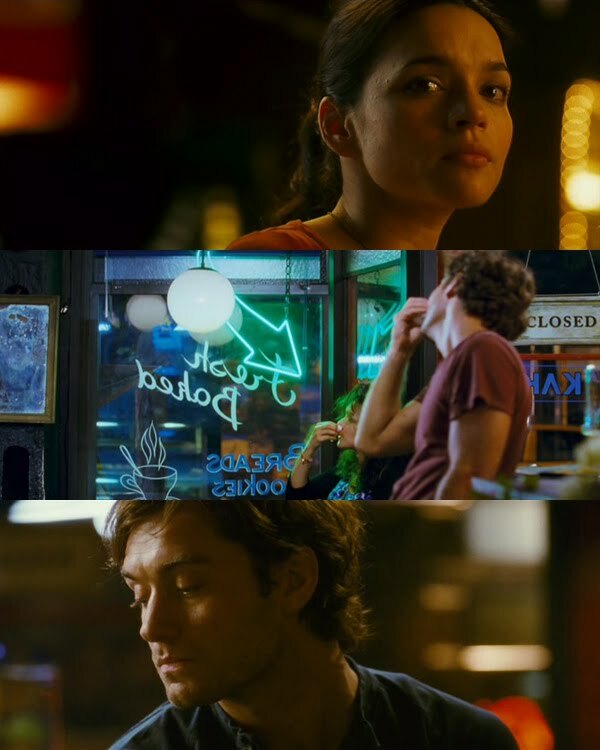 Now when you hear the title My Blueberry Nights, you immediately think, "Mmm, food." And it's not just the blueberry pie Jeremy (Jude Law) shares with Elizabeth (Norah Jones) which you find delicious. It's the ambiance of the film itself. But perhaps Wong thought that 90 minutes for his first English feature film, though already shorter than the average American motion picture, would be too tedious for the American audience with a generous helping of ambiance. The transition between the different chapters of Elizabeth's life far away from the sweet Englishman who consoled her in his cafe with dessert and stories about keys and doors seems too abrupt. The scenes say, "Here's the part where Elizabeth works two jobs in Memphis and meets a drunkard and his estranged wife. And moving on, here's the part where she has a chance encounter in Nevada with a gambler named Leslie." Yet through all those chapters, despite how the characters of David Strathairn, Rachel Weisz and Natalie Portman made Elizabeth's life eventful and interesting, the film showed not in so many words how lonely Elizabeth was away from Jeremy. Sending him postcards with updates on her activities (though not of her whereabouts) wouldn't do anymore. So being more sure of herself and having finally purchased the car she had been saving up for, she returns to the cafe where everything began. She discovers the spot in the counter where she had always sat reserved for her all along by Jeremy. And that final kiss interspersed with close-up shots of cream dripping down a blueberry pie—a sweet ending to a delicious story. "Mmm, food."